A Kardashian-Style Proposal Right Here in NZ! Move over Kanye, you've been one-upped by a Kiwi! Fitness star Josef Rakich has surprised his very lucky girlfriend with a highly publicised, hollywood-style proposal. Josef blindfolded his girlfriend, Maryam Matti, and choppered her into Eden Park in Auckland, where she was presented with a HUGE pink gift box. 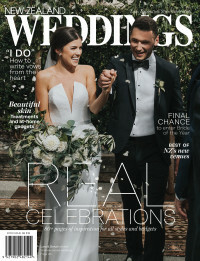 * GET NEW ZEALAND WEDDINGS MAGAZINE DELIVERED TO YOUR DOOR BY CLICKING HERE. Why We Love Art & Matilda's Wedding Style!